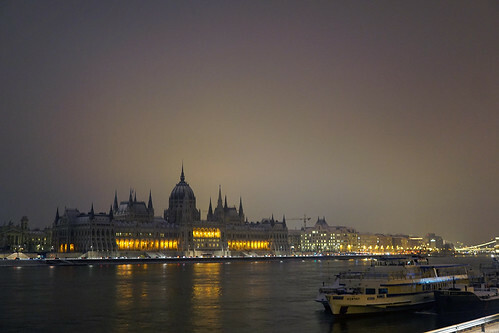 I took this picture when the floodlights of the Hungarian Parliament suddenly went out on a dark January afternoon. I was just walking home on the wharf from the office and took out the camera realizing the unusual view of the emblematic building of Budapest, since the Parliament can rarely be seen so dark. The phenomenon was quite uniqe due to the surrounding glowing smog. I used fix aperture avoiding motion blur while shooting from hand without using a tripod. Snowcaps can also be seen on the dome and on the rooftops. I'm glad for the moment, the result is a dystopia-like Budapest.